This is a wonderful recipe for both vegetarians and non-vegetarians. Serve with some freshly toasted bread. Heat the olive oil and butter in a large frying pan. Add the onion and fry over medium heat for 2-3 minutes or until softened. Add the garlic, wild mushrooms and thyme and cook for a further 2-3 minutes. Add the port, water and lemon juice, season well with salt and pepper. Continue cooking until all the liquid has been absorbed, then set aside to cool. 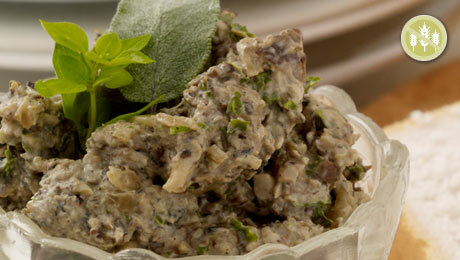 Once cooled, place the mushroom mixture in a food processor with the cream cheese and parsley. Process until almost smooth but still with a little texture. Place the paté in a serving dish and refrigerate for ½ hour to chill.